DuPage County received a CRS rating of 6, meaning unincorporated residents in floodplains are eligible to receive up to a 20 percent discount on their flood insurance premiums. DuPage County officially became enrolled in the program Oct. 1. “This is a tremendous victory for unincorporated DuPage County residents. We estimate having this CRS rating in place will save 751 unincorporated residents nearly $100,000 annually,” said County Board Chairman Dan Cronin. The DuPage County Building and Zoning Division spearheaded the effort and received assistance from the Stormwater Management Department and the Office of Homeland Security and Emergency Management. 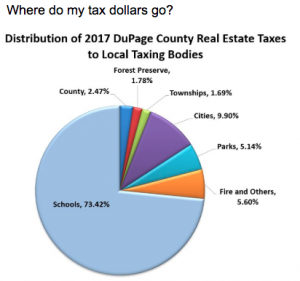 “DuPage County has laid the ground work and provided tools other municipalities in the County can use to either improve their existing CRS rating or to apply for a rating for the first time. This is really a win-win for all DuPage County residents,” said Stormwater Management Committee Chairman Jim Zay. Unincorporated residents who pay flood insurance should contact their insurance provider about how to save money due to DuPage’s new CRS rating. For more information about Stormwater Management in DuPage visit www.dupageco.org/swm.